In response to my earlier posts asking whether today’s clients are more demanding, one commenter observed that increasingly, clients expect lawyers to schedule appointments on evenings and weekends to avoid missing work. The commenter sought feedback on how other lawyers handle these types of requests since the commenter — quite reasonably — would rather not work after-hours either. Certainly, one way not to handle requests for weekend and evening appointments is like this: by posting a curt “Client Expectation Policy” that brags about not working weekends or providing client emergency numbers. (Editor’s note: The Pincus Law Firm in South Carolina, which authored the policy has since dissolved with its principal,Monet Pincus, now a South Carolina judge where she presumably won’t have to worry about working weekends). That said, there’s nothing wrong with a law firm gently explaining its preference to avoid weekend meetings if that’s the firm’s preference. However, for some clients, foregoing weekend and evening meetings is not an option as it could result in a discernible loss of business to competitors who make themselves available. If that’s the case, a lawyer could reserve a single evening each week, or a Saturday or Sunday each month for client meetings – thus accommodating potential clients without significantly encroaching on family time. Lawyers can also determine whether clients are amenable to meetings by Skype or phone which they might be able to fit in on a workday – or would be more convenient for the lawyer even if conducted on the weekend. Of course, there are also some lawyers who actually prefer after-hours meetings. Because my practice is national, clients rarely ask to meet in-person. However, my landowner groups often request an introductory conference calls or webinars, which I prefer to hold on a weekend or after hours to avoid interrupting my workday. And when I worked part-time around my daughters’ daycare and school schedules, I often wished that I could move meetings to nights or weekends since my husband could watch the girls and free me up for additional work. I’ve also thought that an “after-hours” law firm – nights and weekends only – would be an ideal business model for lawyers stuck doing document review. 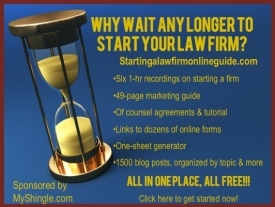 Moreover, lawyers could target this service not just directly at clients, but also offer it to other firms who could contract with after-hours lawyers for initial client meetings (unfortunately, this wouldn’t work for everyone, particularly when the client only wants to meet with a particular lawyer). Those are some of my quick ideas on how lawyers can accommodate changing client demands while still keeping nights and weekends for themselves. But I’d rather hear whether after hours meetings are a problem for you and if so, what steps you’ve taken to solve it. The comment section is open – please chime in!